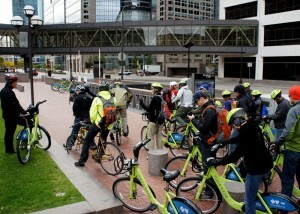 The Utah delegation tries out NiceRideMN, Minneapolis' bike share system. On October 4th and 5th Bike Utah, thanks to generous support from QBP, lead a group of 15 Utahns on a site visit to Minneapolis, MN to learn how to improve Utah’s active transportation infrastructure. Minneapolis currently ranks as the #1 biking city in the US by Bicycle Magazine and Minnesota is ranked #2 on the League of American Bicyclists Bike Friendly States ranking, Utah is ranked 13th. The Utah delegation included Commissioner Louenda Downs, Davis County and Chair of the Active Transportation Committee, Commissioner Larry Ellertson, Utah County, Mayor Mike Caldwell, City of Ogden, Mayor Heather Jackson, Eagle Mountain, Andrew Gruber, Executive Director for Wasatch Front Regional Council, and Matt Sibul, Chief Planning Officer for UTA. The group attended presentations at the capital building and toured Minneapolis on the bike-share program NiceRideMN, SLC will be rolling out a similar bike-share program in the spring. Highlights of the trip included presentations from City officials, local and state advocates, elected officials and an MNDOT representatives, but the real education happened on the bikes when the group toured the Midtown Bike Center, rode the Midtown Greenway, crossed the Stone Arch Bridge to St. Anthony Main – during rush hour. Council Member Robert Lilligren emphasized the importance of the local biking and bike advocacy community for the national reputation Minneapolis enjoys as a leader in biking. The two-day trip examined the recipe of new infrastructure, education and advocacy that helped push Minneapolis and Minnesota to become one of the top biking cities and states in the U.S. Many thanks to our generous partners at QBP and to the City of Minneapolis, NiceRideMN, Bicycle Coalition of Minneapolis, Bicycle Alliance of Minnesota, MetroTransit for hosting the group. One Response to "Group Visits Minnesota to Improve Cycling in Utah"
Utah really does have a poor transportation infrastructure: very few bus routes and trax is limited only to SLC.